Environmental watering in the Latrobe River in 2015–16 aimed to replicate conditions in 2014–15, prompting the first recorded breeding of the Australian grayling. 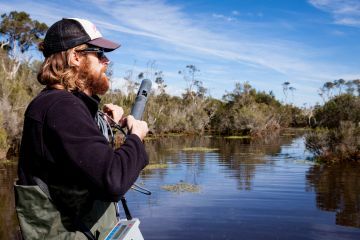 "Monitoring findings available in late 2015 found that the delivery of environmental water in autumn 2015 resulted in the first recorded breeding event of the Australian grayling, a vulnerable species, in this system", said West Gippsland Catchment Management Authority's (CMA) David Stork. "These results were based on larval and egg sampling done immediately after the environmental water release." Larval and egg sampling involves picking up and counting fish eggs in the water to determine the extent of fish breeding. 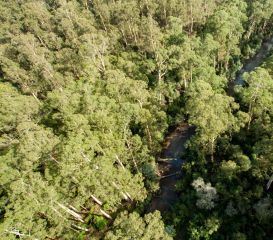 Environmental watering also improved water quality in the lower Latrobe River and enabled water to enter Heart Morass, an important part of the lower Latrobe wetlands. "While waterbird numbers have been low in the region due to drier conditions, a significant number of swans took advantage of the increased food supplies in Heart Morass as a result of the environmental water delivery", David said. "Heart Morass, Dowd Morass and Sale Common were successfully allowed to dry over summer to allow vegetation to grow. Heart Morass was watered in autumn and Sale Common in June. Very high water levels in Lake Wellington filled Dowd Morass in May." In March 2016, with the support of surrounding landholders and the CMA, the Victorian Environmental Water Holder authorised the first watering of a community wetland. Heart Morass, near Sale, was replenished with environmental water diverted from the Latrobe River. The watering mimicked natural flows into the system to provide feeding habitat, particularly for waterbirds, and supported plants. Following the watering, a large number of swans were seen grazing on plants in the wetland. The Latrobe River and lower Latrobe wetlands are very important to the local community. The wetland has undergone more than a decade of community-funded restoration work. This has included removing 20 tonnes of carp, planting more than 50,000 indigenous trees and collecting seed from 50 plant species for regeneration. The land for the 1,349 ha wetland reserve was purchased with funds from the Hugh D.T. Williamson Foundation. The rehabilitation of the reserve is a joint initiative by a group of stakeholders consisting of Field & Game Australia, Bug Blitz, Watermark Inc. and the West Gippsland CMA.